* * Note: It has a set collar (ISIS collar). If you want to purchase the two pieces, we inform you beforehand to deactivate the shipping costs on ETSY, which will run to our account. 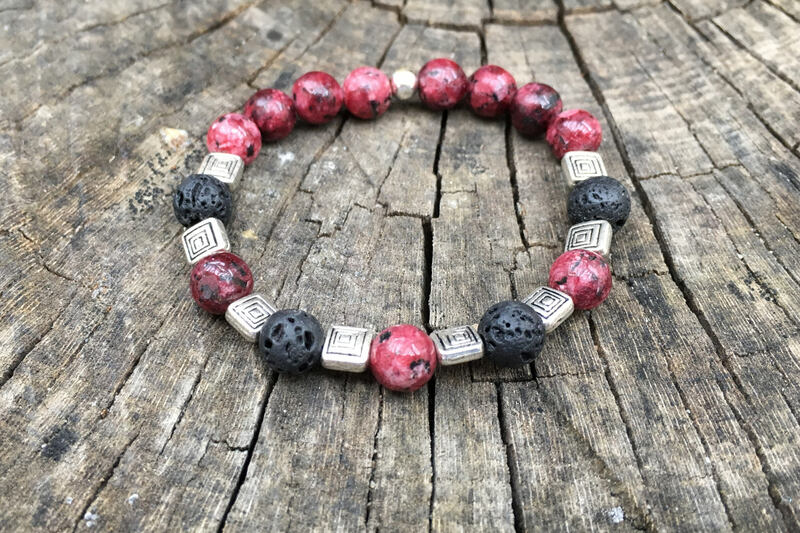 Garnet (8 mm) Sesame Jasper beaded bracelet and black volcanic Lava (8mm) with silver beads. Lava is magma that, during its ascent through the Earth's crust, reaches the surface. It tends to have temperatures ranging from 700 °c to 1,200 ° C, in its ascent the lava experiences: atmospheric pressures that cause it to lose the gases it contained during its ascent. Ambient temperatures responsible for rapid cooling, a rock formed from lava has crystals that are not distinguished at first sight (afanítica or vitreous texture). Lava helps liberate oppressed feelings, provides vitality and exacerbates survival instinct, reinforces feelings of security and confidence, mentally eliminates tensions, black minerals provide security and stability and maintains Away from mental deviations and concentrate our attention on the essentials.